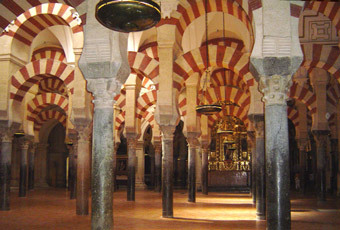 The Mezquita (Mosque), Cordoba - Andalusia, Spain. 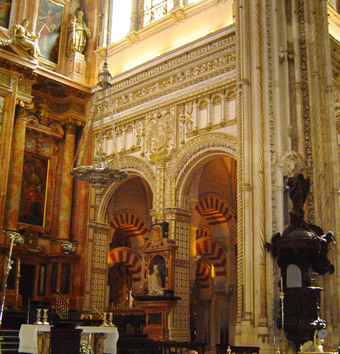 After the reconquest, with the newly regained power in Córdoba, the Christians built a Gothic cathedral in the heart of the mosque. 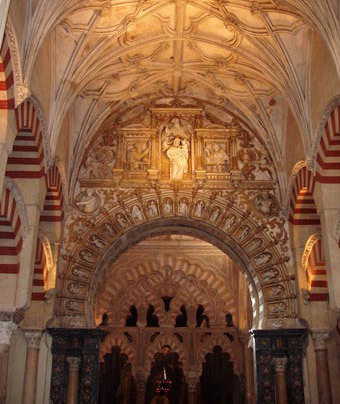 The Cordoba mosque is without doubt a masterpiece of Muslim art. First you will see the Orange Tree Courtyards with its fountains of the era and others in the Mudejar style and the Al-Mansour reservoir from the 10C. Inside you will dive into a forest of columns and arches where shadow et light play. You will visit in particular the extension by Al-Hakam II. Admire the pure wonder that is the mihrab, the superb dome which comes before the three domes of the «maksourah». Outside, notice the minaret by Abd-er-Rahman III which was surrounded by a Baroque tower towards the end of the 16C, the attractive Pardoners gate and, in the north wall the station that contains the Virgin with lanterns, which is a copy of a work by Julio Romero de Torres. Find your hotel in Cordoba right now! As for the Christian constructions, having visited the Royal Chapel of Alfonso X, admire the two pulpits by Michel de Verdiguier in the cathedral, the spectacular coro, and the superb Baroque choir stalls by Pedro Duque Cornejo. Not forgetting a monumental altar curtain of the 16C by Enrique Arfe and a splendid Baroque Christ in marble in the Cardinal's chapel.